Аннотация к книге "The Future History of the Arctic"
`For most of us the Arctic is, above all, an idea. It cannot be mapped, it can only be described. Cold, isolation, emptiness, white, pristine - these are the words it evokes; these are the preconceptions through which we filter all subsequent information about it. Yet many of those preconceptions - the same ones which, as a child, drew me towards the Arctic - are wrong`. Always lingering at the margins of global affairs and at the edge of our mental map, the Arctic has now found its way to the centre of the issues which will challenge and define our world in the twenty-first century: energy security and the struggle for natural resources, climate change and its uncertain speed and consequences, the return of great power competition and the remaking of global trade patterns. 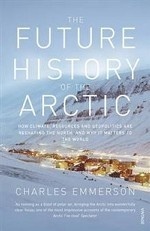 In The Future History of the Arctic, geopolitics expert Charles Emmerson weaves together the history of the region with reportage and reflection, revealing a vast and complex area of the globe, loaded with opportunity and rich in challenges. We travel with him from the oil-fields of Prudhoe Bay to the shores of Greenland, from the northernmost settlement on earth to the militarised borderlands of northern Norway. And along the way we meet diplomats, spies, businessmen, oil-workers, fishermen, politicians and scientists. The Arctic is coming of age. This engrossing book tells the story of how that is happening and how it might happen - through the stories of those who live there, those who study it, and those who will determine its destiny.